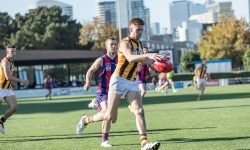 Anthony Brolic has joined a growing list of Box Hill players to re-commit to the Brown and Gold, wth the Hawks number seven signing on for the 2018 VFL season; Brolic needing little time or convincing that the best decision was to remain at City Oval. “The decision to re-sign was a real easy one. A Development League premiership player in 2016, Brolic’s signature was highly sought following an outstanding 2017 season, in which he played every match in the senior side, won VFL Team of the Year selection and finished tied for third in the Col Austen Trophy. “It (the 2017 season) definitely exceeded my expectations. “I couldn’t have imagined half of it and to play every game was a bonus; it was definitely one of my favourite years of footy. Brolic’s versatility and growing confidence became more obvious as the 2017 season progressed, with his performances across half forward and on the wing leading to opportunities on the ball. “I definitely think I play my best footy when I’m around the contest. He would finish the season second in total disposals and fifth for goals amongst his teammates, laying the groundwork for another step forward in 2018. Like many of his teammates, Brolic’s path and exposure to senior VFL football and his successes at that level should inspire the flood of fresh faces who have joined the Hawks ahead of a new season. Now, as he enters his third season on the list, Brolic is well-placed to assess the feeling on the track and how the meld of returning and new names are ensuring preparations for 2018 remain on course. “The atmosphere in the group is really upbeat, as it would be with a smaller size and a lot of fresh faces.